If you are looking for a destination that will give you the goosebumps but also takes your breath away with its ancient beauty, Pompeii is the place for you. The Roman city is located at the foot of Mount Vesuvius and was destroyed by the volcano’s eruption in 79 AD. As Pompeii is pretty close to Naples you should be able to easily go there even for a day trip if you are vacationing in the Italian city. If you are planning to visit Pompeii, Naples or any other Italian city, you should start searching for good travel deals in time! Search the providers from the box and find yourself the best offers in time. Enter departure and travel dates, then select some providers and click ‘compare prices’, it’s that simple. he Vesuvius volcano is millions of years old and, according to scientists, has erupted about 50 times since its forming. During its fatal eruption in 79 AD it has buried the city of Pompeii under a thick layer of volcanic ash killing about 2,000 of its inhabitants. Many of the surrounding cities were badly affected by the destruction, but non like Pompeii which was closest to the mountain. Most of the people did not try to flee the city until it was too late. In the rain of hot ash and burning rocks not even ships could sail out to carry them away. There were attempts of helping them from surrounding places, but no ship could come close to its port. The hot mountain ash poured all over the city for long hours. It eclipsed the sun completely keeping the city in darkness and it entered the houses, cellars and palaces leaving no safe place for those who wanted to find shelter and filling the air with poisonous gases. After the tragic events of the eruption even the legend of Pompeii was slowly forgotten and buried by the centuries and retaken by nature. It took nearly 1,700 years until archaeologists have discovered the ruins of this, once flourishing, city in 1743. Ironically the same volcanic ash that has destroyed the whole city had conserved the bodies of its people very well. Hundreds of people were lying under the tens of tons of ash and rock exactly how they died. It is terrifying to see some of the their faces still expressing the fear and agony they felt in the moment of their deaths. The ash did not only preserve the people but many other – sometimes unusual – things as well. All sorts of usual household items were found in the houses more or less destroyed by the catastrophe. But other objects found give an incredible insight into the everyday life of Pompeiians. Nearly intact bank receipts were also found as well as public mosaics and ‘For rent’ signs, graffiti-like wall paintings and so much more. 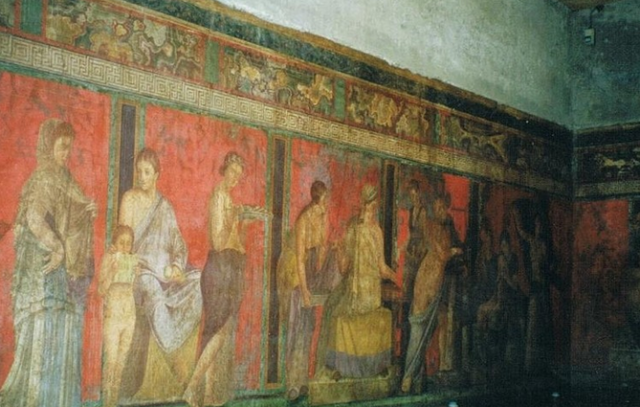 What was probably the most surprising for the historians and is now for visitors is still the detailed frescoes and paintings with explicit sexual content. 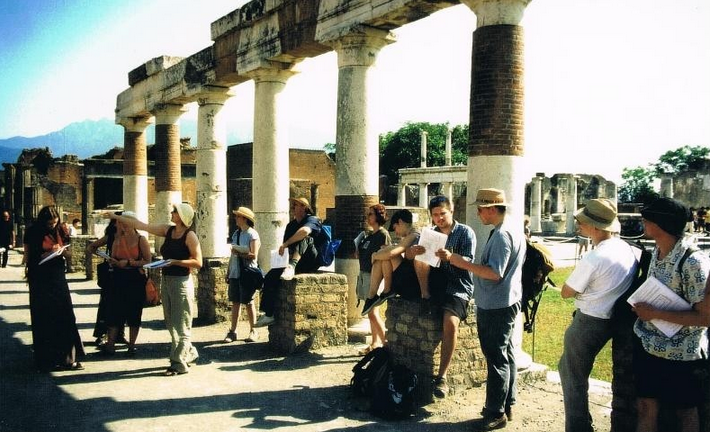 Visitors of Pompeii today can tour nearly the entire city. Excavations are constantly in process, but a huge part of the place is open for visitors. You should not miss immense Amphitheater of Pompeii where you can imagine yourself into a Roman play watched by hundreds of the locals. The House of the Faun is also a must visit. It was an immense villa of a very wealth – but yet unknown – man. The different rooms of the house suggest that there was a place for all kinds of activities separately while the name of the house comes from a bronze statue in the main room presenting a dancing of a faun. The forum of Pompeii was the political and economical center of the city. Public buildings and arcades were built around the Forum that gave home to shops, religious events and political debates alike. 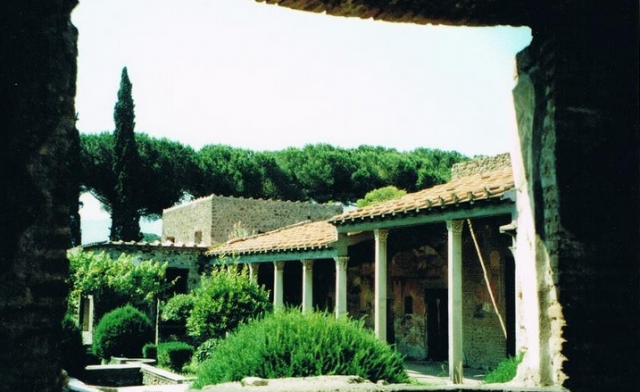 For a little more blitheness you should go and see The Lupanare, the brothel of the Roman city. It had too floors, one for commoners and one for the wealthy, balconies and nicely furnished rooms with wall paintings of lovers in different sexual positions. There are lots of other ruins to admire in Pompeii, but what you will also love about it is that it is not overly commercialized. There is only one small restaurant and cafe plus restrooms on the huge archaeological site and you have to do all the eating and shopping in the tourist village next to the site. You can go on an organized tour or discover the ruins on your own. If you go on a tour you will not have much liberty in what to see and in how much time, but you will finish faster. If you go on your own, you should definitely double the time you have planned to spend in the city as you will find new things to admire on every corner. 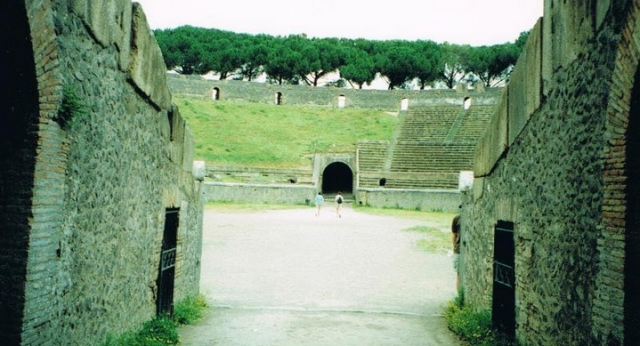 The Pompeii archaeological site is part of a larger site of 5 locations. If you want to visit all of them you can buy one ticket for all, it is cheaper than bought separately. As most of the Pompeii site is sunny, you should also bring some sunscreen and water with you, plus a hat maybe. You can also get a map of the whole site at the entrance gate – you will probably need one and it is also a nice free souvenir. If the do not offer it, you should ask for a map. Also note that in the morning after opening you will probably have to wait in a long line but if you come right after noon it is much less busy. Visiting Naples is a great idea for this spring or summer’s vacation. If you are going anywhere in this region of Italy, you must also make at least one day free in your plans to visit the ancient city of Pompeii.